Patchwork quilt made from diamond patches in the 'Cotton Box' pattern, in a wide variety of cotton fabrics, including plains, checks, stripes and florals. The patches have blotting paper templates. 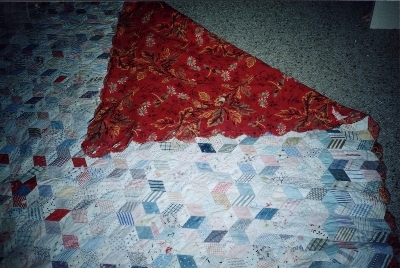 The quilt is edged with diamond shapes in a red floral cotton. The backing is of the same red floral pattern, featuring yellow, turquoise and white flowers and leaves. Hand sewn. Made c.1890-1900 by Mrs Sophia Mary Wilbow of Windsor (NSW). Owned by her daughter Mrs Louisa Best, then Jack and Grace Best. Owned by the Yass & District Historical Society (NSW). "Mrs Sophia Mary Wilbow of Windsor NSW. The mother of Mrs Louisa Best, wife of John Thomas Best of 'The Pines', Tangmangaroo [NSW]. They were parents of Jack (and Grace) Best and grandparents of John R. Best present owner of 'The Pines'. 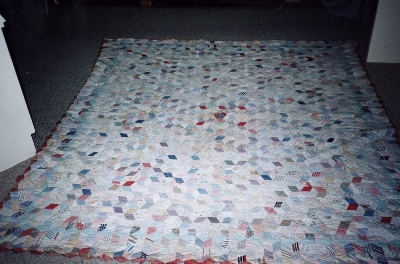 The quilt is all hand done & lined with blotting paper & made over 80 years ago & she made one for each of her daughters."